Sow February-March with heat under glass. Will grow outdoors but if planted in greenhouse a little pruning may be necessary. The fruit is enclosed in a papery husk and is ripe when outer husk begins to peel away from the base. Tall (but height is variable) plant produces bright orange, sweet fruit. 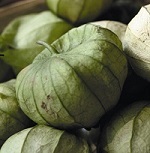 Sharp-tasting, greenish yellow, about 1½" (4cm) across, used extensively in Mexican salsas and adds zing to ratatouille. Rampant growing. Small, sweet yellow fruit with a hint of pineapple. Low growing. Slightly smaller and sweeter. Low growing plant.